Florida is a boater’s paradise but you need to know about the state’s boating regulations and safety tips before you venture out on the water! Anyone born after 1/1/1988 who operates a motorboat with 10 or more horsepower must complete an approved boating safety course and carry the Boating Safety Education ID Card issued by the Florida Wildlife Commission. There are exceptions to this rule and the entire list is available through the Florida Fish and Wildlife’s website. There are also lists of required safety equipment. What is required by law depends on the size of the vessel. Please note that even canoes, kayaks and paddleboards have minimum requirements, so please check the link for exact information. Florida is surrounded on three sides by water and has numerous lakes. Perhaps that is why the state offers so much excellent information on their websites. One of the things boaters will find useful is a complete list of both fresh and salt water public boat ramps. You can also sign up for updates on fishing and boating regulations. Remember, safety should be your first concern. Make the waterways a fun and safe place for all by following the state regulations. Thai Bay & Sushi Restaurant in Largo Florida was my destination today for lunch with a close friend. We both love the food at Thai Bay and we are always sampling something different. This restaurant is also an absolutely beautiful place to dine. Thai restaurants have a reputation for their intricate wood carvings, Thai statues and orchid plants everywhere and Thai Bay Restaurant is no exception. This is the perfect location for a special occasion, a business meeting or meeting with friends. Thai Bay has a wonderful lunch menu and a larger dinner menu. No matter which menu you use, the food is always more than enough and everything is prepared excellently. From the tasty Thai Tea and Thai Spring Rolls to the large selection of main entries, you are sure to be pleased and your taste buds will be delighted. Naturally, Thai coconut ice cream with litchi nuts is delicious end to any meal. When looking for an outstanding location to dine, be sure to check out Thai Bay & Sushi Restaurant located at 1300 East Bay Drive in Largo Florida. The location is convenient to all sections of Pinellas County since it is in the approximate center of our county and also near the Gulf Beaches. I do indeed believe that you will be glad to have tried this beautiful restaurant. Ozona Florida always has a minimal number of homes for sale due to the fact that it is such a small community. Located west of Palm Harbor, south of Crystal Beach and just north of Dunedin and Honeymoon Island State Park, Ozona Florida lies on the shores of St Joseph’s Sound and the Gulf of Mexico and has actually been incorporated into Palm Harbor 34683. This quaint seaside village was once a fishing village with not much else in the area. Today it is a refuge from the hustle and bustle of modern life where you can retreat to peace and quiet but still be close enough to all of the modern conveniences. Incorporated into Greater Palm Harbor Florida, Ozona is zoned for some of the best schools in Pinellas County. It is also convenient to the University of South Florida campuses in Tampa and St Petersburg as well as being ‘just down the road’ from the Tarpon Springs campus of St Petersburg College. The Pinellas Trail offers 47 miles of biking and hiking trail that connects the entire county from north to south. The trail also connects Ozona to Wall Springs Park, a few miles up the road in Palm Harbor. Ozona is an eclectic combination of small bungalows and multi-million dollar waterfront homes with a feeling of ‘neighborhood’ that you don’t often encounter. Here you will truly find something for every budget. The Dunedin Fine Art Center is indeed where magic happens! Located at 1143 Michigan Blvd in quaint Dunedin Florida, there is always something going on at the Dunedin Fine Art Center! Dunedin Fine Art Center always has exhibits going on in their four galleries. They feature not only local artists but an assortment from all over the country. As far as classes are concerned, the youngest age is four years of age and the oldest can easily be a great-great-great grandma! When it comes to the arts, there are no age limits. DFAC offers classes in pottery, pastels, acrylic painting, oil painting, drawing, digital imaging, glass and enamel art, jewelry making, fiber arts, metal arts, mixed media, photography, print making, sculpture, water media, and even classes specifically for teens and the little ones. Naturally, the summer camps fill up quickly, so it is always best to register as soon as possible. There are also special weekend workshops taking place throughout the year in a variety of areas, so be sure to check out their entire schedule of offerings. Classes are scheduled between the hours of 9 am and 10 pm, so there really is a wide range to choose from. If you cannot find something in a time that works for you and you have a group of friends also wanting that class, chances are good that DFAC will attempt to accommodate you. They will certainly try to get an instructor for your group if it is large enough. The Palm Cafe is open Monday through Friday from 10 am to 2 pm. Here you can get a snack or something to drink and sit with friends to chat. The children’s museum, exhibits and gallery gift shop hours are 10 am to 5 pm Monday through Friday, 10-2 Saturday and 1-4 Sunday. This is truly an art center that is almost always open! All levels of classes are also available, from beginner to advanced, so be sure to check out their offerings. Once you take your first class, you will find yourself addicted to the Dunedin Fine Art Center! Dunedin Causeway is a great destination for summer fun! At Sail Honeymoon you can rent kayaks, trimarans, a 17-foot Windrider or a stand up paddleboard! Located directly on Dunedin Causeway’s south side, Sail Honeymoon has been a local business renting kayaks for years but in the last couple of years they have expanded and now also rent trimarans, catamarans and the ever so popular paddleboard. Along with the rental comes instructions if needed and the staff will also supply you with life jackets, paddles and a dry bag to keep your belongings safe during your excursion out on St Joseph’s Sound. Sail Honeymoon is located a short distance from Caladesi Island State Park and off the causeway on your way to Honeymoon Island State Park. Caladesi Island is only accessible by boat, there are no cars on the island. There are kayak trails wandering through the mangroves and over 6 miles of inland waterways waiting to be explored! You can rent a sit-on-top kayak or a sit-in kayak and even use the kayak to go fishing for the day! The single kayaks start at $30 for 2 hours but are only $55 for the entire day! The doubles are $40 for 2 hours and $70 for the day. The 16 foot long Windrider Trimarans are perfect for up to 3 people. These are $75 for 2 hours and $150 for the entire day. What better way to enjoy the beautiful waters of St Joseph’s Sound? If you are interested in the 17 foot Windrider, which has a capacity of up to 5 people and a cooler, they are $95 for 2 hours and $175 for the day. All of these kayaks and sailboats have a four hour price as well and you can get that information by simply calling Sail Honeymoon at 727-734-0392. Oh, and the stand-up paddleboards are only $25 for an hour or $35 for 2 hours! How could I almost forget these popular boards? Sail Honeymoon just received the ‘green light’ from the City of Dunedin to extend their contract for having this location on the Dunedin Causeway for another ten years, so they are not going anywhere. This is great news since this is a popular destination for young and not so young alike! 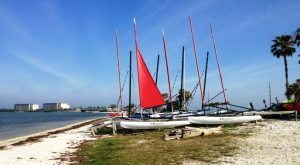 If you are looking for something to do during the long hot summer, consider renting one of these great kayaks or sailboats and really getting out on the open waters off the Dunedin Causeway! 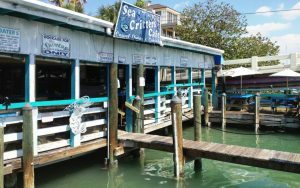 Sea Critters Cafe and the Hurricane Seafood Restaurant, are fantastic summer destinations on St Pete Beach’s Pass-a-Grille. Located on the southern-most section of St Pete Beach, Pass-a-Grille offers pristine beaches and a great selection of locations for dining on local seafood. The beaches are never as very crowded and what better place to take a long walk than along the miles of white sandy beaches that run north and south here in Pinellas County? With the combination of turquoise water, pure white sand and the pale blue skies, it is indeed a little piece of Paradise on Earth! One of my favorite locations for dining on Pass-a-Grille Beach is Sea Critters Café, located at 2007 Pass-a-Grille Way. You can dine inside or out at the docks where locals come to tie up their boats for lunch. Either way, you will find a friendly staff and first rate dining. Fresh fish is served daily and you can have it blackened or grilled. Their grouper is fantastic but so is the red snapper or the blackened shrimp! If you are looking for nightlife, be sure to check out the Hurricane Seafood Restaurant. Built in 1912, the Hurricane Seafood Restaurant offers homemade conch, bisque and clam chowder along with a wide range of other seafood dishes. In 1991 the Hurricane added a second floor and this became Stormy’s Nightclub. The Hurricane Watch Roof-top offers live entertainment and some of the best views around of the sun setting over the Gulf of Mexico! The Hurricane Seafood Restaurant is open seven days a week beginning at 7 am. A great meeting place for breakfast, it is really one place you need to check out while enjoying the beaches on Pass-a-Grille. There are also numerous short and long term beach rentals available on Pass-a-Grille Beach, so be sure to check the area out for your next beach holiday! You will be glad you did! Condo vs Co-op: What Is The Difference? Condo vs Co-op: What is the difference? Clients often ask me just that question since it is indeed confusing! Let me attempt to provide a little clarity on this topic. Ownership: A condo owner actually owns the condo, as any homeowner would. In a co-op situation you don’t actually own any specific real estate, instead you own shares in a corporation and as a shareholder, you have the right to lease space in the building. The co-op owns the building and the common areas and you own a share of that. Upon your death, a condo is considered real property and passed on in the family. A co-op is considered intangible personal property. Your attorney can go into details about how that is passed on. Condo vs Co-op: What about taxes? A condo owner is taxed individually since they own the condo as real estate. Co-op property is owned by a corporation and the corporation is taxed. It then passes the cost on to the shareholders. Can I get financing for a co-op? Since you do not own any real property when you own shares in a co-op, financing can be difficult to obtain. Many co-ops have a relationship with a few specific lenders that will finance units in the building but more often you see co-op purchases happening as cash deals. It is much more difficult, if not just about impossible, to get a home equity line of credit on a co-op since you don’t own any actual real estate, you own shares in a corporation. The downpayment on loans is also higher and normally the interest rates are higher as well. When considering purchasing a co-op, it pays to discuss the situation with an attorney so you are clear about what you are doing. That will provide peace of mind for you and your family. Many purchase into a co-op without doing their homework and are later surprised by the fact that they are not property owners but shareholders. There is indeed a difference in ownership when owning a condo vs a co-op. Pinellas County Florida Botanical Gardens is located in Largo Florida. Here you can wander through over 30 acres of cultivated gardens and view the wildlife in the 90 acres that are kept in their natural, wild state. The cultivated gardens include a herb garden, palm garden, tropical fruit garden, patio garden, butterfly garden, succulent garden, bromeliad garden, native plants garden and a seasonal plantings display area. In addition to that, there is a beautiful wedding garden as well as a tropical courtyard. Naturally, a botanical garden down here in Florida would not be complete without an aquatic habitat demonstration area with a large retention pond complete with water lilies and alligators. There are also sixty acres that were once used for agriculture and are now being restored to it’s natural state. Volunteers are available to answer your questions throughout the park. There is also a gift shop and an information center where you can bring in plants or soil to receive guidance on your own garden. Pinellas County Florida Botanical Gardens is adjacent to both the Florida Gulf Coast Center for Fishing (with their interactive museum) and Heritage Village (28 historic structures dating back to the 19th century). This is the perfect destination for the entire family! The botanical gardens are open seven days a week.